Grab the kids and head into the great outdoors around Novato where you can explore plenty of family-friendly hiking trails. The following recommended outings are suitable for all-terrain strollers, mountain bikes, and dogs on leash. Karen Pavone is a Novato resident and writer, specializing in artisan food production and sustainable agriculture. Indian Valley Fire Road is a popular destination for those seeking a leisurely stroll through beautiful coastal woodlands. This flat, three-quarter mile long fire road stretches between the Indian Valley College campus and Indian Valley Road. The trail follows a seasonal creek with lots of shade provided by native live oak and bay trees. Parking at the trailhead on Indian Valley Road is limited but free. Accessing the trail from the college campus requires purchasing a parking permit. Note: Permits are $3.00/day; machines only accept quarters and dollar bills. *Restrooms available by the athletic field. Horseback riding allowed. The Rush Creek Trail is a level, three mile loop accessed on the east side of Highway 101 off the frontage road at the San Marin Drive/Atherton exit. The well-traveled path meanders along the Pinheiro fire road bordering a tidal estuary teeming with thousands of birds and plentiful wildlife. 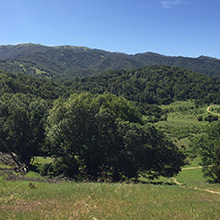 The trail is mostly unshaded and flows through a picturesque grassland dotted with seasonal wildflowers and the largest stand of Blue Oak trees in Marin County. Horseback riders are also welcome here. Roadside parking is free. *No restrooms. Horseback riding allowed. 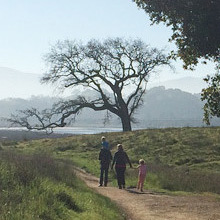 The Bay Trail in nearby Ignacio connects Hamilton Field Air Force Base north to Bel Marin Keys and is easily accessible from several points in between. The flat, beautifully manicured 2.7 mile walking and cycling path is part of the larger Bay Trail Project that will eventually ring the perimeter of the bay and connect all nine Bay Area counties. With stunning views of Novato's Mt. Burdell to the north and Mt. Diablo to the east, the broad trail borders wetlands where you can sight resident and migratory waterfowl. Scenic viewing points and educational placards highlighting the history of the trail dot the path.